The best places to preach Tâi-uân-sîn are the places holding the pro-Taiwan social movement. Obviously, these pro-Taiwan activists are more inclined to accept the faith of 228 Tâi-uân-sîn than pro-China supporters. 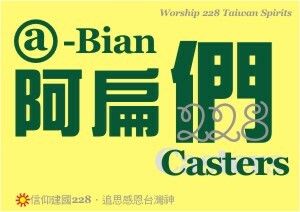 The first attempt to promote “Worship Tâi-uân-sîn” in such activity took place in the “228 Hand in Hand Rally” at Taichung in 2004. 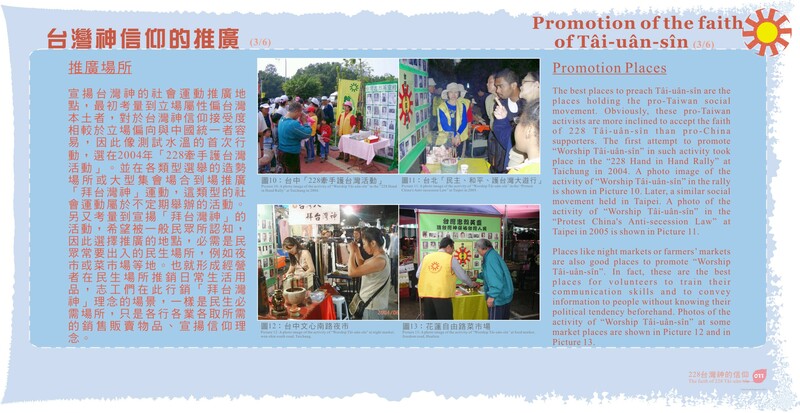 A photo image of the activity of “Worship Tâi-uân-sîn” in the rally is shown in Picture 10. Later, a similar social movement held in Taipei. A photo of the activity of “Worship Tâi-uân-sîn” in the “Protest China's Anti-secession Law” at Taipei in 2005 is shown in Picture 11. Places like night markets or farmers’ markets are also good places to promote “Worship Tâi-uân-sîn”. In fact, these are the best places for volunteers to train their communication skills and to convey information to people without knowing their political tendency beforehand. Photos of the activity of “Worship Tâi-uân-sîn” at some market places are shown in Picture 12 and in Picture 13.